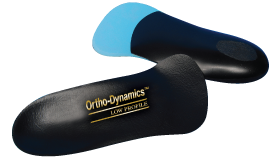 Designed to provide semi-flexible to semi-rigid control in the limited confines of a dress shoe. Activity: Designed to fit and function in a flat, slip-on or lace dress shoe. Components: Offered in 3mm or 4mm polypropylene shell. Intrinsic rear foot and forefoot posting. Shell narrowed to bisect 1st and 5th met heads. Shell top covered with layer of 1/16 poron for comfort and extension protected by felt = undercover. Available in met, sulcus or full length. Footwear: Flats, slip-ons or lace dress shoes. 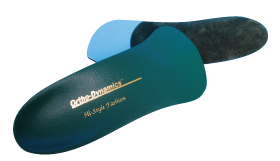 Activity: Designed to provide semi-flexible control in a women’s pump or flat dress shoe or shoe with a narrower shank. Components: Offered in 2mm or 3mm co-polymer shell. Intrinsic rear foot and forefoot posting. Shell top covered with layer of 1/16 poron for comfort and extension protected by felt undercover. Available in met, sulcus or full length. Footwear: Pumps, low heel or flat dress shoes. Activity: Designed to provide moderate control and stability in a women’s dress shoe. Components: Offered in 2mm or 3mm subortholene shell. Intrinsic rear foot and forefoot posting. Shell narrowed to bisect 1st and 5th met heads. Shell top covered with layer of 1/16 poron for comfort and suede undercover. Available in met, sulcus or full length. Footwear: Slip-ons, pumps or lace dress shoes. 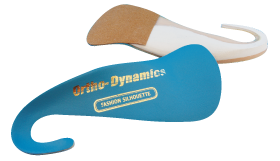 Activity: Designed to provide moderate control and stability in a women’s heel shoe. Components: Offered in 2mm, 3mm or 4mm subortholene shell. 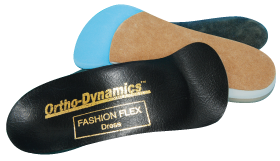 Center of heel shell and lateral borders cut out to reduce overall bulk and allow heel to adjust to heel contour of shoe. Extrinsic low bulk rear foot post and arch filler for added support and control and extension protected by felt undercover. Available in met, sulcus or full length. Footwear: Low to high heel women’s dress shoes. 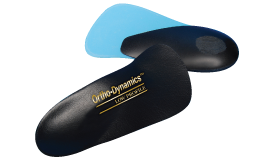 Activity: Designed to provide moderate control and stability in a men’s dress shoe. Components: Offered in 3mm or 4mm polypropylene shell. Intrinsic rear foot and forefoot posting. Shell narrowed to bisect 1st and 5th met heads. Shell top covered with layer of 1/16 poron for comfort and extension protected by felt undercover. Available in met, sulcus or full length. Footwear: All slip-ons or lace dress shoes. Components: Offered in 3mm or 4mm polypropylene shell. Intrinsic rear foot and forefoot posting. Shell narrowed to bisect 1st and 5th met heads. Shell top covered with layer of 1/16 poron for comfort and suede undercover. Available in met, sulcus or full length. Footwear: All men’s slip-ons or lace dress shoes. Activity: Designed to provide semi-flexible to semi-rigid control and stability. Components: Offered in 2mm, 3mm or 4mm subortholene shell. 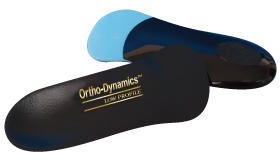 Low bulk extrinsic rear foot post and arch filler with special shell cut-out for shock absorption. 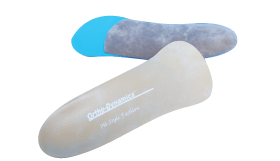 Shell top covered with layer of 1/16 poron or 1/8 poron for comfort and entire plantar surface and extension protected by felt undercover. Available in met, sulcus or full length. Footwear: Men’s and Women’s lace dress shoes, low sided sneakers or clogs with open backs.